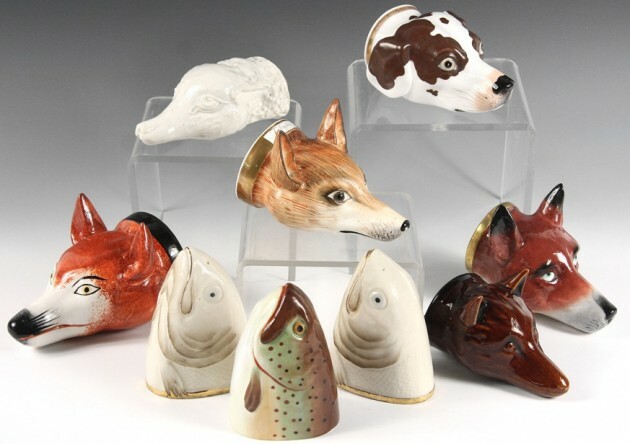 A collection of English porcelain and ceramic “Stirrup Cups.” This photo was sent to me (10/2011) by Thomaston Place Auction Galleries in Maine. Thank you! There is not much more to say about these pieces except they are fun to collect due to the diversity of styles that can be found; made from all over Europe and about in every material but I have not seen one (yet) in ivory! Besides England these cups were made later both in America and Germany as well. 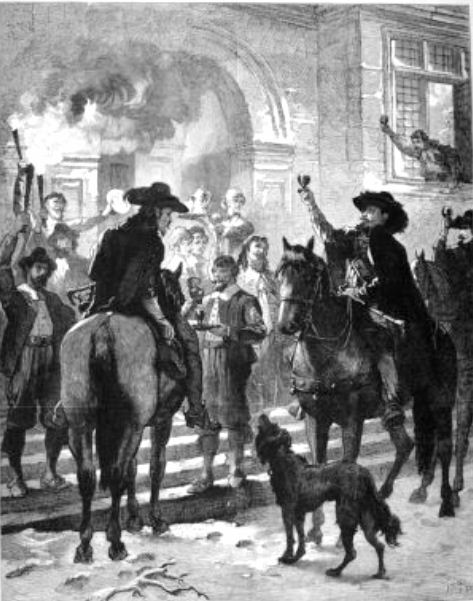 For use a s hunting men gathered on horseback a welcome drink was a typical start to the day. This elegant Viking glass above belongs to the type of glass called “tragtbægere” – the most common drinking glass from this period. 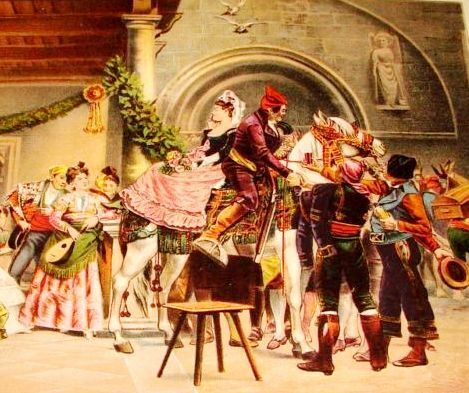 It is known and has been seen with many different decorations and expression throughout Scandinavia. The shape of the glass has been used to tell and explain something about the so-called “Germanic drinking habits”. They were in fact obliged to drink to the bottom was reached, as they of good reason – qua glass form – could not put it down. The enclosed glass holder in iron, which is spiral is in fact a contemporary design to meet today’s needs for a glass that can stand by itself. The Vikings drank beer and mead. Mead, however, was made blah. using honey and therefore not all cropped to enjoy, while the beer was very similar to the taste of beer today, however, flavored and made with bog myrtle instead of hops. This type of Viking glass known from both Ribe, Birka and Hedeby and is frequently found in women’s graves. The glass has in his time most likely, found its way to Scandinavia from the Frankish kingdom, and was brought home by the Vikings from one of their many trips. Between 1670 and 1760 “dram cups” or “tot cups” were used to serve drinks to English riders. These small two-inch silver handled bowls with feet have been referred to as Stirrup Cups. It is generally accepted, however, that the distinction between these predecessors and the classic form is that Stirrup Cups are a shape easily held in the hand while on horseback, and therefore had no need of a foot. 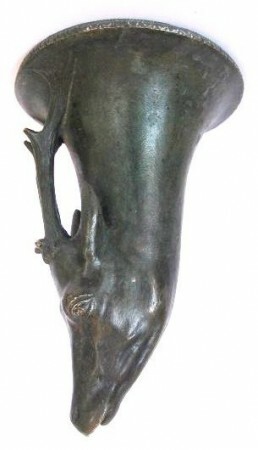 One of the original forms of The [English] Stirrup Cup. These were carried from the tavern to the riders outside, sitting in a round wooden container which might have 4 or 6 holes cut in it to accommodate blown glasses such as this one. 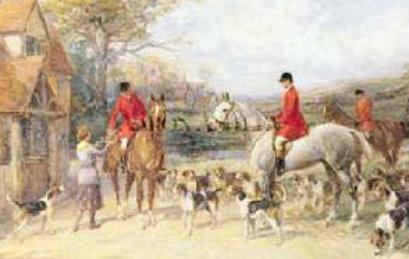 It is the traditional drink, usually port or sherry, served at the meet, prior to the fox hunt. The term can describe the cup that such a drink is served in. The host in colloquial Highland Scotland (as well as other places) may well invite his guest to stay briefly for that farewell drink. The Scots call it a “dochan doruis.” This comes from Scottish Gaelic “deoch an dorais”, literally= “drink at the door”. 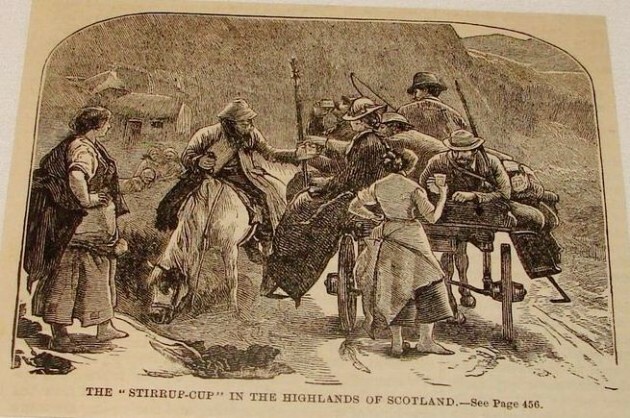 The title is: THE “STIRRUP CUP” IN THE HIGHLANDS OF SCOTLAND = Road side service at its best! I assume the door is just off to the left. An English “Fox” with a lovely engraved scene on its top half. 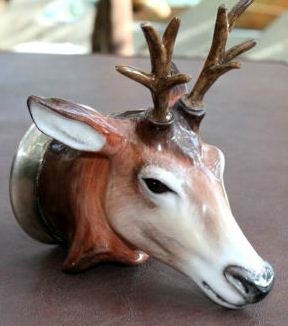 Circa 1850-70, where the ears and nose make the cup’s feet, so it can be used on a table or handed to someone in their stirrups. The engraving of the upper portion was also quite popular in early Holland. Dog’s head . 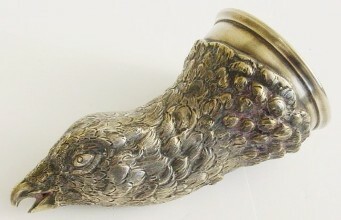 4.2 inch long, Russian silver and gilt silver. Assayed 1896. The classic mask or head Stirrup Cups date from 1760. 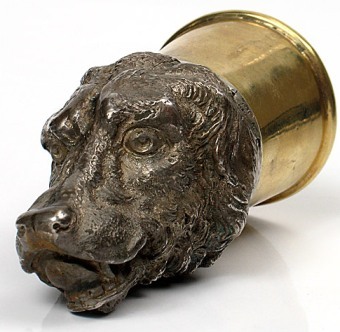 Early examples of fox and hound heads were hand-chased silver made in two halves and soldered together. 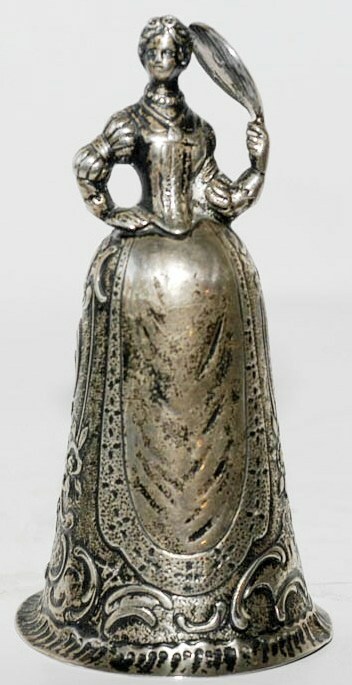 Typically in this type of art, silver is soon followed by earthenware. 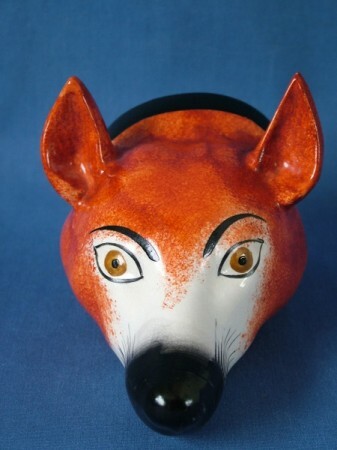 Staffordshire pottery Fox head stirrup cup. 3.5ins high, 3.5ins wide, 5.2ins depth. Edwardian. Circa 1910. A very well done porcelain (?) 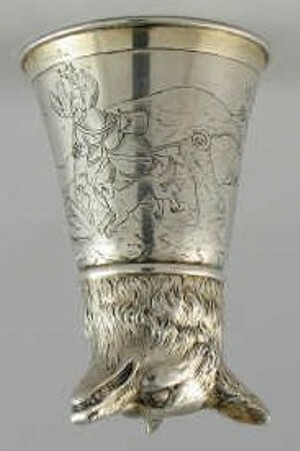 stirrup cup, silver mounts. 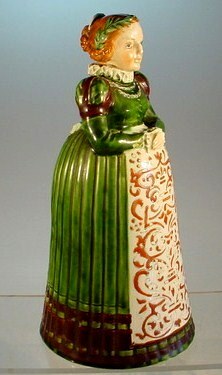 BLOOR POTTERY, 5 inches long. Some English Georgian glass stirrup cups still can be found, although the originals are very expensive They usually have a long thick stem with a ball on the end. 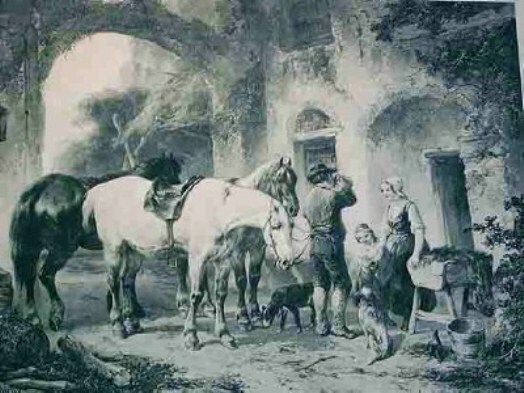 Several were carried at on time on a wooden holder to the outside of an Inn to be served to the huntsmen while in their stirrups. Not all later (after the glass form) stirrup cups were in animal form. Shown: An older, circa 1800’s German (.800) silver beaker that could have been used as a Stirrup Cup at a rich persons home. The item in her hand is a fan that has been bent. As above but with no fan. Not many stein collectors have ever seen this one. It is a V & B Metttlach stirrup cup / standing beaker. 8/2 inches tall. Mold No. 5245. Not many of these were marked at all, and therefore fall under the radar. 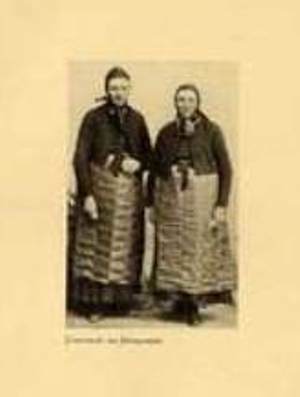 In case you think the dress that the woman has on in the V & B Mettlach beaker above is strange looking, here is a photo I recovered off eBay that shows that some German women actually did dress that way. Other animals make for a great collection. Shown: A horse”s head: 6.5 inches, heated and then molded bone with silver mounts. Not marked, but most probably South American. [FWTD] With the history of the Gauchos, the need for the serving of drinks while in the saddles persists. An older Russian rabbit / hare. About 5 inches. This one had all the required by ‘the state’, hall marks. 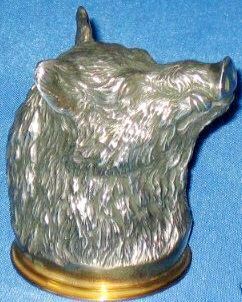 Another boar – this one with very definite feet, more of a shot glass or a “vodka kicker” to be used at a table as it is only 5 CM high (= 2.0 inches) [X] 4.3 CM. ! ‘1877’ with only the Russian standard grade mark 84. 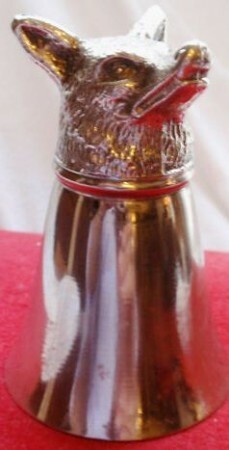 Fox’s head, German, 4.5 inches, .800 Silver with the Crescent and Crown (made after 1888.) An interesting slanted body. Mule’s head – Old Russian St. Petersburg silver hall marks. 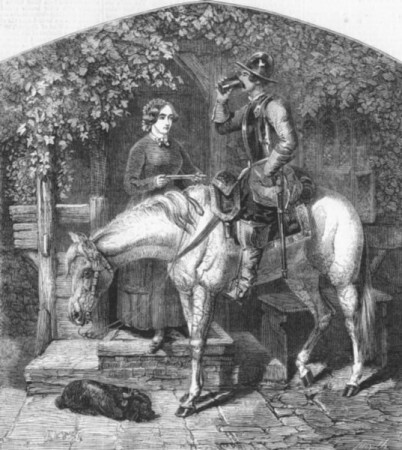 “STIRRUP CUP” – Original antique wood engraved print,1850. Artist unknown. 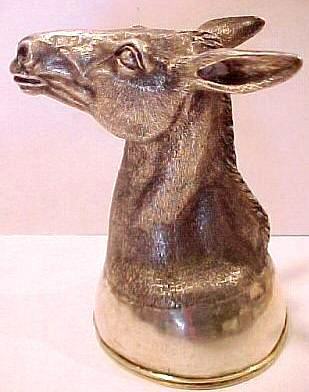 This piece was called a “Bronze Stirrup Cup.” (Recently, 2012, sold on eBay.) It is 7.5 inch long, and 5 inch wide at the base, or top depending. The stein collector’s jury is still out on this one as to exactly what it is. First it is pretty damn heavy to be a cup = 2 lbs / 8 oz. Second that top of is very wide to drink out= 5 inches and it has a “beaded lip” both of which might inhibit drinking more than a bit. Lastly the form, with the antlers so close to the body (within about a half of an inch) would not be conducive to picking up and passing it to someone, as one can not put one’s fingers under the antlers. 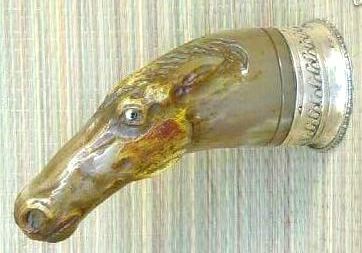 However, several of us drinking vessel collectors could come up with no other apparent use, except perhaps a “decorative” stirrup cup, for use on a fireplace mantle or an old sideboard. Other thoughts are welcome! A very new Russian stirrup cup in the form of the Czar’s Mounted Guard Unit helmet. Gilded silver. While this one is newer there are older ones to be found, and when so done, they are “very” expensive. Much, much newer than most of those shown above. 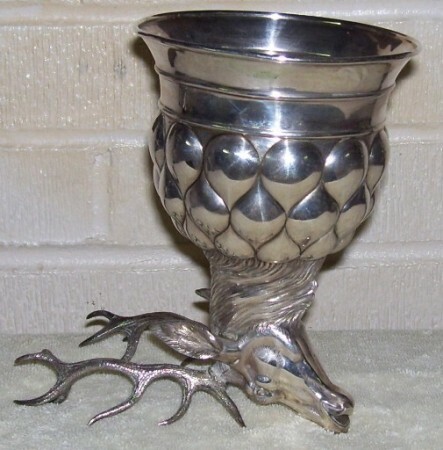 These cups are made of pewter and can be found in great numbers on the secondary market. 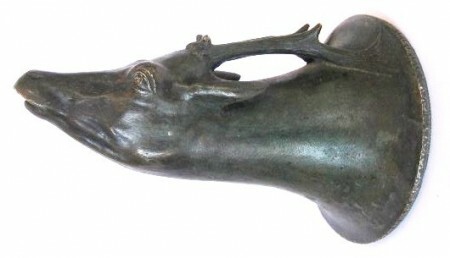 Lots were used as a “jiggers.” Various animals are depicted; hare, eagles, deer, dogs, foxes and even cows! 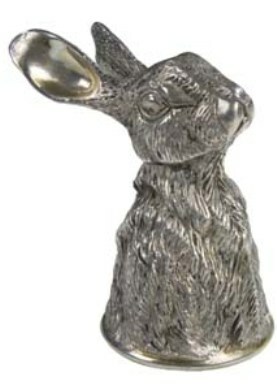 These are also still being made in pewter and silver plate, and some today as the animal character cups, in glass. 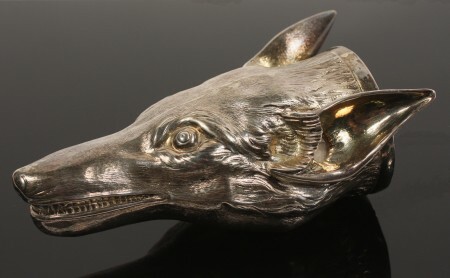 A new silver-plated version of the same Fox’s head as above. 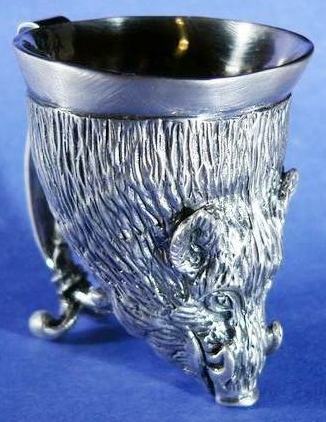 A beautiful sterling silver fox’s head cup – Also sent to me (10/2011) by Thomaston Place Auction Galleries in Maine. 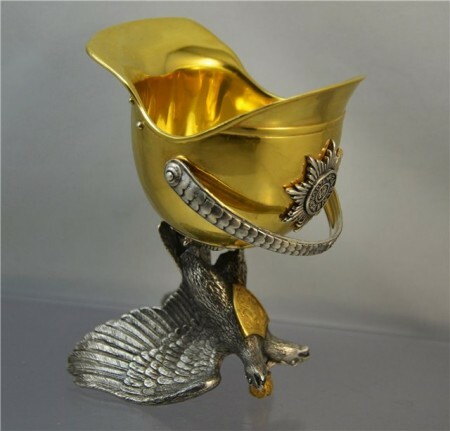 Shown: A later day Russian silver “stirrup cup”, in a form of a bird’s head. 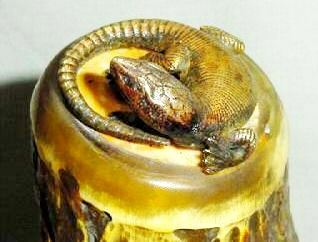 ▲Smith’s Museum and Tavern’s contribution to ‘this “Stirrup Cup” page. 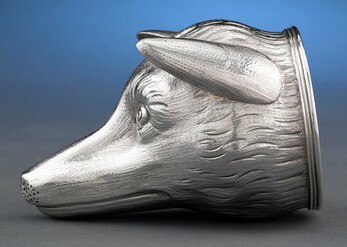 A German .800 silver ” Stirrup Cup” – 6.5 inches tall and 6.0 inches tip of antlers to its nose. Stamped marked: C WEISHAFPT and a (City of Munich City mark.) Ca.1910. Editor’s note: for photos of very early stirrup cup type drinking vessels see “Rython” in this site’s compendium.